New vampires probably shouldn’t be involved in anything Titanic-themed. Jane Jameson is back and she’s the matron of honor in her best friend’s wedding to his ladylove werewolf. Zeb and Jolene want a Titanic-themed wedding because…well why not? Jane is not overly excited about the wedding, losing her best friend’s undivided attention, her mysterious boyfriend’s recent odd behavior, and the consistent pressure from Zeb’s mother to stop the wedding so Jane can marry Zeb. You’d think all of it would be too much for a newbie vampire but Jane still finds time to look into her grandmother’s sixth fiancé. Although her plate is more than full with anything but food, Jane and her friends transverse the crazy town of Half Moon Hollows once more. 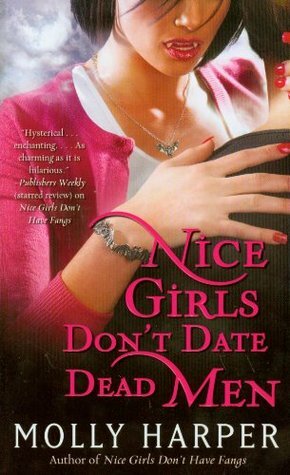 Nice Girls Don’t Date Dead Men is book two in the Jane Jameson series by Molly Harper. Although you technically don’t need to read book one to understand this one as the author does a really nice job of reminding new and returning readers of important details, I think readers should as it’s essential to understanding the cast dynamic and fully appreciating the characters themselves. In this new outing, Jane doesn’t really mature much unfortunately and I thought she came off slightly worse for the wear with her antics. The plot revolves around Jane’s best friend Zeb getting married; an event that Jane is ambivalent about at best since she’s struggling to come to terms with Zeb maturing and growing up while she isn’t. Additionally Zeb’s mother, Mama Ginger, is of course a caricature from hell bent on destroying the wedding in an attempt to make Zeb and Jane marry instead. I found the story humorous and entertaining for the most part. The few issues I had were that Jane could have easily stopped the drama with Zeb’s mother by simply telling her that Jane was a vampire. Of course there would be no book with over the top wacky hijinks if logic actually prevailed so there is a reason for the lack of any common sense. Whether readers like that or not is a personal choice. Furthermore it was almost ridiculously easy to figure out what was going on, and who the bad guy was this time, and Jane started to look rather stupid in not figuring it out sooner. The book did everything but paint neon signs with the answers while Jane just shrugged and did nothing to add any intelligence nor intuitive thinking to any of the problems brought up. So I was much less enamored of Jane’s pratfalls, witty mumblings, and general air of buffoonery in combination with her less than average intelligence. That said I still love the ensemble cast of characters and their ability to act as wonderful counterpoints to Jane’s sometimes irritating personality. I am not a huge Jane lover as she feels like a character pandering to a certain reading demographic. However the supporting cast is funny, entertaining, and generally helps soothe over any frustration. The writing is quick and easy to absorb without really remembering the details. It’s a little repetitive and formulaic to be sure but with the lack of real humor in the vampire genre I find this series much like ice cream. It’s not exactly something to be proud of binging on but it seems to taste so good at the time.